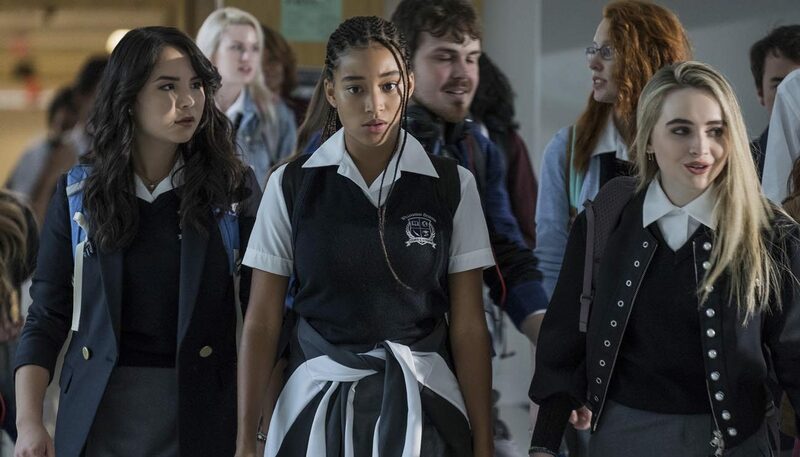 NEW YORK (CNS) — “The Hate U Give” (Fox) is the kind of movie that used to be hyped as “torn from today’s headlines.” A more restrained characterization would simply say that this compelling drama explores painful real-life issues of racial justice by fictionalizing them. That’s an exercise from which mature teens as well as adults might potentially benefit, especially since the violence inherent in the story is handled discreetly. But parents should be aware that the film’s artistic merits and positive values come accompanied by quite a bit of low-level profanity and other objectionable talk. In an intense and sympathy-winning performance, Amandla Stenberg plays 16-year-old African-American Starr Carter. Starr serves both as the story’s protagonist and, off and on, by way of internal monologue, as its narrator. Thus she introduces us to the two worlds between which she divides her time: Garden Heights, the mostly black working-class neighborhood where she lives, and Williamson Prep, the predominantly white private school she attends. Starr also tips us off to the fact that she feels compelled to adjust her personality and behavior to suit each environment. It’s an uneasy equilibrium, but she makes it work — at least, that is, until fate intervenes. While Starr is driving home from a party with her childhood friend and first crush, Khalil (Algee Smith), the duo is pulled over by a white police officer (Drew Starkey). A verbal confrontation ensues, and the riled-up cop, mistaking Khalil’s hairbrush for a gun, shoots and fatally wounds him. As Starr copes with the resulting personal trauma, she suddenly finds herself caught up in the bitter, racially divided reaction to Khalil’s death. Subpoenaed to testify before a grand jury, she’s also urged by local activist April Ofrah (Issa Rae) to go public with what she saw. But telling the whole truth would put her at odds with King (Anthony Mackie), Garden Heights’ reigning drug lord, for whom Khalil was working. Additionally, the fallout from Khalil’s demise alters Starr’s relationship with Hailey (Sabrina Carpenter), one of her two best pals at Williamson, and with her boyfriend, Chris (K.J. Apa), both of whom are white. As the crisis deepens, Starr looks to her wise parents, Maverick (Russell Hornsby) and Lisa (Regina Hall), for guidance. Although passionate in tone, screenwriter Audrey Wells and director George Tillman Jr.’s screen version of Angie Thomas’ best-selling 2017 novel for young adults maintains credibility by its evenhandedness. Starkey’s character, Officer 115 (as he’s known from his badge number), for instance, is shown to be nervous, certainly reckless but genuinely confused rather than malicious. And Maverick, from whom Starr has long concealed her romance, is not easily reconciled to Chris’ pale hue when the two finally meet. Ultimately, the picture points toward gestures of peace as the means of breaking the tragic cycle in which a resort to crime on the part of the poor as the only means of survival is met by a sometimes-trigger-happy response on the part of law enforcement. That’s a recipe viewers committed to Gospel morality will easily endorse. The film contains brief graphic violence with some gore, nonlethal clashes, a narcotics theme, a scene of urination, numerous mild oaths, at least one use of the F-word and pervasive crude and crass language. The Catholic News Service classification is A-III — adults. The Motion Picture Association of America rating is PG-13 — parents strongly cautioned. Some material may be inappropriate for children under 13.